Over a year ago, I posted a list of my kitchen faves and wants, and on that list was an Instant Pot. I was fortunate to receive one for Christmas last year from hubs, and I've really been enjoying it ever since. (Also, cool side note: the creators of Instant Pot are from Ottawa, like me! Gotta love unexpectedly supporting a local business). While I might be the queen of kitchen gadgets, this is one gadget that doesn't sit on the shelf for very long. For the last year, I've been experimenting with hard boiled eggs (4 minutes on high pressure is perfect! ), roasts, beans, overnight oatmeal, stews, curries, etc. I love this thing - in fact, I'm going to use it again tonight, and give this honey-bourbon chicken recipe a try (I'll serve with some quinoa and roasted frozen broccoli). I recently read about making risotto in the instant pot, and that really appealed to me. I'm always multi-tasking in the kitchen, so I don't often make risotto, as it takes way too much attention at the stove, for far too long. I had read that you could make deliciously creamy risotto in the instant pot, so I decided to give it a go. I did a twist on this mushroom risotto recipe, and it turned out really well! I changed the quantity, and I think in the future, I might reduce the liquid by about a 1/2 cup, and when I do the larger volume in the pot (1.5 c rice, vs the original recipe's 1 c), I would reduce the cook time to 4 minutes, just to reflect that the larger liquid volume takes longer to build pressure, and that in turn cooks the rice for a bit longer than necessary. I've put those changes in the recipe below. This tastes great, and best of all, no stirring. I wouldn't say it's really any faster than stove-top risotto, but it is a lot more convenient. I made my own lobster stock and I found that really added a nice flavour to the risotto, but it's by no means necessary - normal stock (veg or chicken) would work very well. And this recipe very easily becomes vegan by just skipping adding butter at the end and using veg stock. I'll separate out the recipe for the lobster stock, so anyone who isn't making their own stock can just ignore that portion. Sobeys had lobsters on for $8.99/lb, so I picked up a couple of lobsters there (and had them steamed in store, which Sobeys does for free - yay!). They were not huge lobsters, and I knew they wouldn't be enough to feed all four of us dinner, so risotto was a great way to serve something indulgent and pricey, without having to spend a fortune (the two lobsters came to about $20). Hubs was kind enough to take the lobster meat out of the lobsters for me. 1. Add all ingredients to the instant pot (or other electric pressure cooker, or just a large pot on the stove). 2. Add enough water to cover, up to about the 3.5L line. 3. Cook on high pressure (use the Manual function) for 30 minutes. You can do a natural release or a quick release, depending on how rushed you are. If you're doing it on the stove, just simmer for 2-3 hours on low. 4. Strain contents. Taste. I found mine was a little bit bland (with just two carcasses), so I added a small spoon of Better than Bouillon vegetable base, to just up the salt/umami quality and it was perfect then. If you have more lobsters, this probably would not be an issue. 1. Using the Sauté function, heat the Instant Pot on high, then add the olive oil. Sauté the onion and mushrooms for a few minutes, then add the garlic. 2. Once the mushrooms have released their liquid (and the liquid has evaporated), add the rice and stir well. Then add the white wine and stir until it's mostly evaporated. 3. Add the broth, then seal the instant pot. Switch the IP to manual (high) and set to cook for 4 minutes. 4. When the time is up (if this is your first time using an instant pot, note that it takes a while to come to seal, then the pressure needs to build, and THEN it starts counting down....it doesn't really cook in 4 minutes total!). 5. Once the timer is done, grab a light tea towel, and carefully do a quick pressure release. My experience with starchy things like rice and pasta is that they often sputter and make a bit of a mess. I usually put oven mitts on before I do a QR, then release with a wooden spoon. If I see any mess, I toss the tea towel over top to catch it. It works pretty well, though be sure to use a nice light towel. This didn't make as much of a mess as I was expecting, but it did sputter a bit. Also, quick release isn't instantaneous - I think mine took about 3 minutes to come down. 6. Remove the lid once the pressure has released. Stir in the lemon juice, butter and nutritional yeast/parmesan. Stir in a nice handful of chopped chives and parsley. Serve with more fresh herbs over top. While my risotto was cooking, I reheated my lobster in a steamer, just for a few minutes. I then tossed the warm lobster with some butter and sprinkled some chives on. 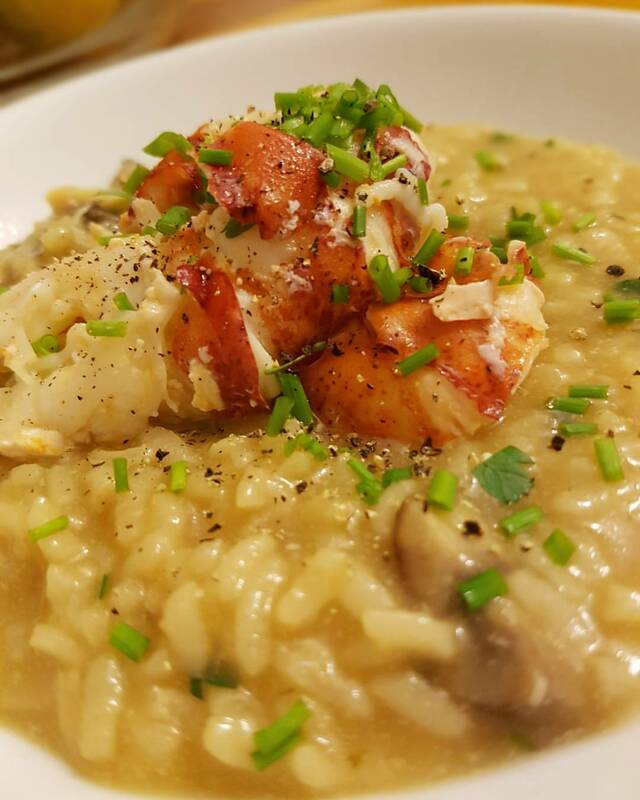 I served the risotto with the lobster on top, topped with more chives and parsley. I love the fresh burst from the herbs.